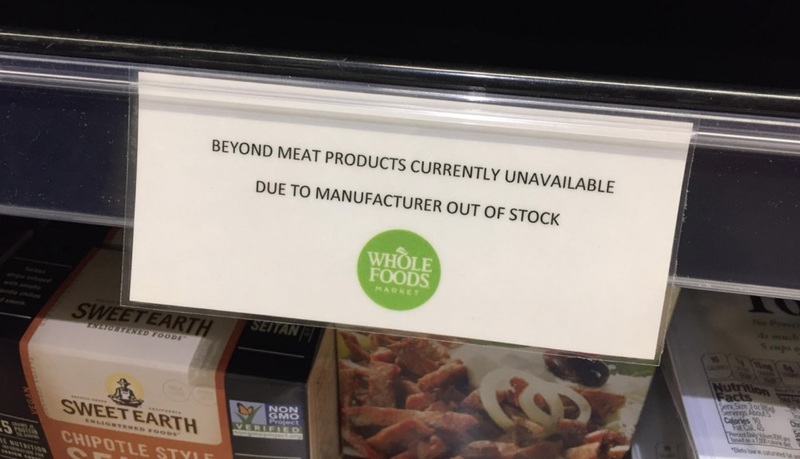 US retail giant Whole Foods is out of plant-based Beyond Meat stock at select locations due to demand so high the producer can't 'keep up'. A photo shared this week to alternative social media website Reddit, pictured a sign in store explaining the shortage. This trend was also confirmed by Beyond Meat Executive Chairman Seth Goldman in a Plant Based News exclusive earlier this month. Discussing the Beyond Sausage - which is currently only offered at Whole Foods - he told PBN Founder Klaus Mitchell: "We are not able to keep up with the demand just in that chain. "It's gunna be a while before it makes it over to Europe." Due to the explosive demand, Beyond Meat recently announced plans to open new production facilities - which will effectively triple the brand's production capacity and allow for an expanded range of products. On top of this, Beyond Meat CEO Ethan Brown said: "Our expansion not only brings more jobs and opportunity to this special community but also furthers Missouri's position as a leader in the production of plant-based meat."